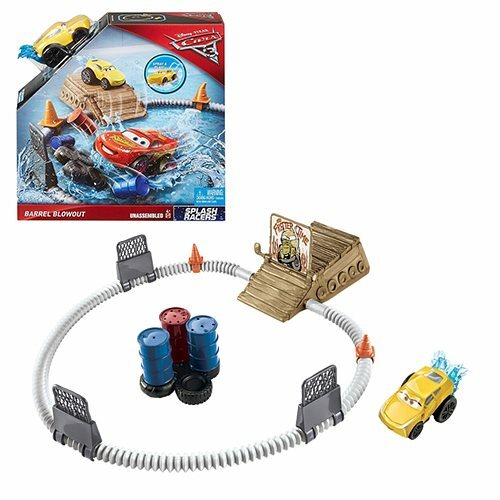 Get ready for splashing, crashing water action with this Cars 3 Splash Racers Barrel Blowout Playset! Modeled after the latest arena, fans can reenact those movie scenes or configure the course for their own water challenges. Navigate around obstacles, knock out the floating tires, then upend the barrel stack as you try to out race the competition. The set includes 1 Bath Splasher Lightning McQueen vehicle, a ramp, starting gate, plastic flag ropes, plus start, and finish signs. Add other Splash Racers vehicles(sold separately) and challenge them to the obstacle course!